Oh WOW! Now THAT WAS intense, and crazy, and exciting and heartwarming and heart-wrenching and soooooo…. wow. I have a lump in my throat. I think it’s my heart. It’s stuck! Unforgettable!!! I had NO idea what I was getting into. None. Except for a few comments (some making me VERY excited to read this, and some… well. I misinterpreted a few and I’m glad they weren’t actual spoilers). *phew* Thank you to EVERYONE that did their best to keep mum on the actual contents of this book. Everyone that left a comment in my direction, y’all did so perfectly. I thought I might know too much (at first, going in), but I didn’t, and I got to experience this one in full. Summer: I just finished the most amazing book! It’s called Rainfall by Melissa Delport. It’s been awhile since I have read a 5 star book. This book has so much emotion. I highly recommend everyone check it out. It was so touching just sucked me right in and what a twist! I can’t recommend it enough to everyone! Kandace: Summer I finished it this morning and I’m still a hot mess. I loved it! Summer: Kandace I was so gutted I am still recovering today! Di-Ann: Just finished and loved it! Andee: I just finished Rainfall on Thursday — I know you’ll love it! I couldn’t put it down but it definitely wrecked me in the best way. Kandace: Please read Rainfall before you accidentally see a spoiler. This is a perfect book for our group. Blind is the way to go. Yep! I went into this one, “blind enough”, and then my mind went to work. I had some ideas. And more ideas, and twists and turns and I was right for some, and wrong for others but… no matter what I managed to guess, I was on the edge of my seat for the entire second half, and couldn’t put it down. WOW what a ride!!! Paige’s father has Alzheimers, and her fiancé is shot and killed in an armed robbery. Paige fights her depression and pulls herself out of the dark place that she has succumbed to, with monumental effort and a new-found determination to live her life to the fullest, doing things that both terrify and exhilarate her. When Paige meets Adam, the attraction is instantaneous. Adam grew up in an orphanage and has no recollection of his life before the age of six. Paige falls head over heels in love and embraces a happiness she never dreamed possible. Until the day she finds Adam in bed with another woman. Wanting nothing more to do with him, Paige cuts Adam out of her life, until she receives a mysterious visitor, who reveals secrets about Adam’s past that shock Paige to her very core. Determined to fight for the man that she loves, Paige finds herself on a journey that will change her life forever. And boy was I right!!!!! WHOA. That blurb totally jolted me, and this book delivered! It must have been SO hard on the author to write such an intriguing, exciting synopsis, without giving anything away. Pure genius on that! And on how the story comes to fruition, too. When my friend Kandace told me to read it, assuring me I’d love it, and to go into it blindly, she was right. Kandace: I just finished Rainfall by Melissa Delport. I LOVED this story. I’ve never read a story like this. Rainfall a unique story that has twist after twist. I laughed! I cried! I felt everything! I highly recommend it. I wish I could tell you more but knowing anything about this story will ruin the experience. Do NOT read any reviews. Go in blind. I promise you all will love it. I could not put it down. Can you tell I’m excited? I’m going to be thinking about these characters for weeks. Maryse: I WANT TO READ THIS!!!!!! I put it on that latest list and OMG I WANT IT!!! This is MINE tonight. YAY!! I decided! Kandace: I wish I could watch your reactions as you read it. If you are like me, and love to experience every surprise, be jolted by every little twist, and love guessing your way through an entire book, in full-intensity, DO NOT read reviews, or comments or anything because ANY little reaction might “mess” with your experience of this intricate, unique love story. In fact, my own mind and perception of where the story was leading was sort of “messed” with in regards to a few comments left. THANK GOODNESS I misinterpreted the comments, and therefore was still super-surprised throughout, right to the last line. BUT!!! I’ll admit it was a bit of a slow start for me, connection wise. Oh it was interesting RIGHT from the start, but I wasn’t fully invested at first, for a portion of the first half. While the story intrigued me from the beginning, and I was excited to read it, for some reason, I had a hard time meshing with the writing style. The flow, the dialogue, her thought processes. I can only say that it felt a little “rushed”, maybe even a little light or “flat?” by way of her internal monologue (considering the potential intensity of it all). A little too light (for me) in regards to the difficulties that she was about to take on. A little too nonchalant by way of reader-emotion, and with some of the things she experienced, at first. Oh, she told us… the information and the scenes had enough detail for me not to be confused, and for the story to continue it’s progress… but I didn’t FEEL her that much, you know? I questioned a lot, in regards to the heroine, and found myself skimming slightly, at times. I was reading on the outside, looking in, but very curious about the story, nonetheless. I had to know what was making everyone freak out! 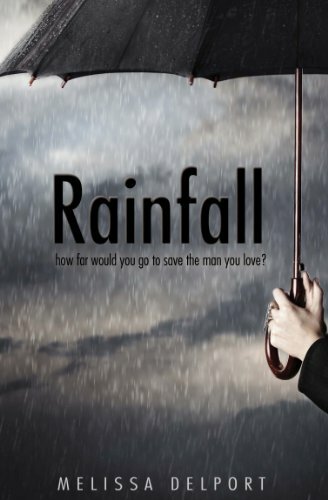 Jackie: Don’t stop reading Rainfall….huge twist at the end and worth it. Okay now you can come back!!! You guys ready for this? READ IT! Absolutely UNFORGETTABLE, totally entertaining and your heart WILL be consumed! If you’re in the mood for a jolt-inducing read? THIS!!!!!!! June 2017 UPDATE: I loved Rainfall so hard, but originally gave it 4.5 stars. Since I still remember every single thing about this one, and still feel that intensity and ache, and haunt… I’m upping it to 5 stars. Years later and I still feel this book? Yeah. Five stars for sure! Yay! Loved your review! I agree 100% with your overall rating. I felt 5 stars for the uniqueness of it… but the connection at the beginning was slow. I felt everything you felt, too. Great read, but I needed something different after that one. What’s next for you? I can’t wait to see your TBR list. Great review- summed it up, without giving anything away. I can so relate to how you described how you felt when you reached the end- emotions all over the place. Ha! Just went to sample this and I have it already, that hasn’t happened in a while, looks great!! I was so hoping you were going to review this book soon! I read it back when you had first brought it to my attention and I loved it so much. Your review was spot on. Thanks for another great read! Just finished reading it. So unexpected with twist and outcome. Author is a genius and did a great job writing on a difficult topic. Live life to the fullest; as though it is your last. Read this awhile back great story. Loved your review it was spot on!!!! I was feeling the same as you at the end of this book Maryse! Great review! Great review Maryse…i loved the way you wrote about it without giving a hint of the twist. completely agree with your rating on this one ! You finally read it! Glad I didn’t scare you off of it. This one just rocked my world. But I can’t say it’s my favorite book. I can only repeat what I’ve said before – it is simply gut wrenching. The way you described how you felt was exactly how I felt. I stayed up till 2 in the morning to finish it. I could not stop thinking about the book and was up all night. Talk about a book hangover!!! I am reading Rainfall now and I cannot put it down….I am nervous based on the responses up top but looking forward to it. I’m having a hard time with Rainfall….I really want to finish it, based on the reviews, but I’m struggling. Words of encouragement, please! Such an original story. Haven’t come across anything quite like it yet. Kind of ripped my heart out, but totally worth it. Great read! Stick with it ladies! This totally ripped my heart out, tbh I kind of wish I hadn’t read it…..
My feelings exactly. I was semi enjoying angsty reads until this one. It’s turned me off to them, maybe forever. I’m now afraid to start any book that appears to have heartbreak in it.